Looking for something different to light your driveway or walkway? Consider Hammerworks Gooseneck Post Lights Model SL510. 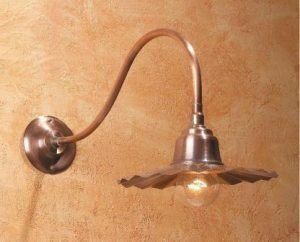 As always our Gooseneck Lighting is expertly handcrafted with solid copper or brass. We also offer a custom verdigris finish. In addition the durable powder coated black arm will last for years to come. Most noteworthy these Gooseneck Post Lights have been adapted to use as walkway lighting and landscape lighting. This innovative adaptation of Gooseneck Lighting is a simple yet elegant way to illuminate and enhance your landscape design. Furthermore this side mount pole version in addition to illuminating a driveway or walkway, is ideal in an outdoor kitchen barbecue area and backyard deck. More importantly in addition to the charming “pie plate” crimped round shade we make a streamlined cone style. Thus the Gooseneck Post Lighting SL511 offers the same look but with the cone shade. Of course because sign lights are completely handmade it allows multiple possibilities for custom alterations. 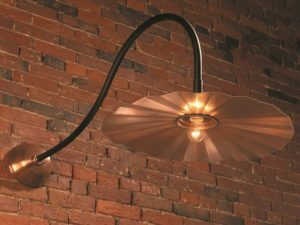 Furthermore while Gooseneck lighting fixtures are intended for exterior use, Interior Gooseneck Lighting is gaining in popularity. For example with its’ straight arm Pendant Fluted Shade Light SLS509 makes ideal task lighting. Common applications include kitchen island & counter lighting, over a bathroom vanity and even pool tables. In addition restaurants often use them over salad bars or table booths. Going further use Outdoor Gooseneck Lights SLS504 as a wall accent to complete the look.Thus from interior commercial applications to contemporary kitchens and beyond Gooseneck Sign Lighting provides a unique option for any lighting design scheme.